What a ride. 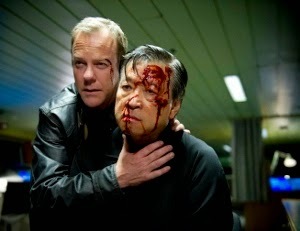 24: Live Another Day ended its 12-episode run with an episode that embodied everything that made the show great in the past. Though the last 12 weeks inspired plenty of snark from some critics, much of it focusing on Kiefer Sutherland’s advancing age and the supposed tiredness of the real-time concept, LAD delivered classic 24 that, for better or worse, never attempted to reinvent the wheel. I would hazard a guess that the return of Jack Bauer did not win over an inordinate amount of new fans. TV has moved on in the four years since Jack disappeared. But it’s probably safe to say that millions of original fans got exactly what they were hoping for. But is there any more to follow? Should there be any more? (Spoilers ahead!) Prior to LAD, the last time we saw Jack he was truly on his own; a wanted man, viewed as a dangerous terrorist. But there was at least the chance that he might escape his pursuers and find a way to leave his past traumas behind him. Throughout LAD the big question has been, where will it leave Jack? Will he go home to see Kim and the grandkids? Will he and Audrey (Kim Raver) rekindle their romance? Could he wind up dead? The answer is “none of the above” as the finale felt like a cliffhanger that may never be resolved. There was certainly finality in the death of Audrey, a tragedy that resulted in what I think was the first we didn’t hear the iconic beeping as the digital clock took us into a commercial break. 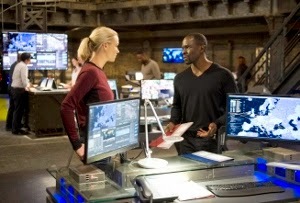 And Jack came perilously close to death – by his own hand – upon hearing the news from Kate (Yvonne Strahovski). Speaking of that moment, it was a showcase of subtlety in a series known for bombast. It was not just some of Sutherland’s best acting of the season, it was perhaps the defining moment for Jack in the entire series. No matter how many times his hunches prove correct, no matter how many times his order-defying behavior saves the day, Jack simply cannot evade personal tragedy. But he not only chose to carry on, he went complete berserk – avenging Audrey by first proving that Cheng (Tzi Ma) was, in fact, alive (President Wei didn’t believe so), and second by lopping off Cheng’s head with a single sword swipe. War with China is evaded, but clearly the true highpoints of the finale were these numerous emotional moments. 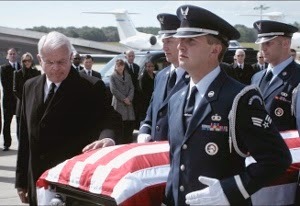 William Devane stole his share of scenes as President Heller, but he scored his most memorable moment as he lamented his failing memory as his daughter’s flag-draped casket was transported to Air Force One. Heller’s Alzheimer’s didn’t factor into the storytelling the way many felt it would. There were very few moments of mental instability. Heller gets through the tumultuous day without too many significant forgetful episodes, despite early suggestions to the contrary. Heller likely wished he really had been blown up by Margot Al-Harazi earlier in the season, when the impending drone attack on London was the worst of everyone’s concerns. It all comes down to Heller, seeming as if he barely believes the truths he’s speaking, telling Prime Minister Davies (Stephen Fry) that soon enough he won’t even remember he had a daughter, let alone the tragic manner in which she died. And then there was Chloe (Mary Lyn Rajskub). Sidelined for several episodes, stuck with an unattractive emo/goth makeover, and paired with the supremely unappealing love interest Adrian Cross (Michael Wincott), Chloe got the short end of the stick throughout LAD. She even winds up in the undignified position of temporarily losing Jack’s trust when he suspects that she was involved in Cross’ nefarious override device dealings. But in the end, it’s Chloe who compels Jack to commit another act of self-sacrifice as he turns himself over to the Russians. And while this could very well be the real end for Jack, it might not be the one fans want. Maybe it was a fate Jack couldn’t escape after saving the world over the course of nine individual days over the last 13 years. But I’m hoping someday soon we get to see Chloe and Kate team up for massive rescue attempt.